Patrick Denny, a final year student from Harper Adams University, was crowned this year’s RABDF Dairy Student Award winner after beating four others in the final round at the Farmers Club, London. He was presented with a £1,000 cash prize and trophy provided by competition sponsor Mole Valley Farmers. The runner up was Aimee Ash, also from Harper Adams University. 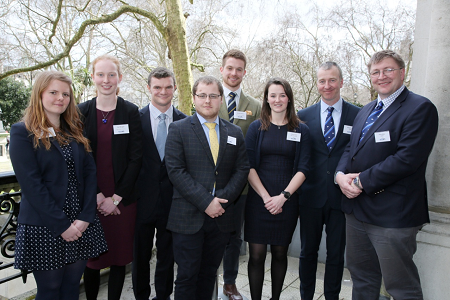 Patrick and Aimee, plus the three other finalists Zoe Morgan and William Turner (Aberystwyth University, IBERS) and Tom Furness (Myerscough College) were chosen from entries from seven agricultural colleges and universities across the country. Each gave a presentation on ‘The UK Dairy industry in the next 10 years’ before taking part in a discussion session chaired by Mike Green, editor of British Dairying. Award winner Patrick Denny said he was delighted to have won this year’s competition and to have brought the title back to Harper for a fourth consecutive year. The son of two dentists, Patrick did not grow up on a farm but has been getting on-farm experience since the age of 14. He spent his placement year working on a 450 cow, autumn calving, grass-based farm in Cheshire and is due to start work at Velcourt as a trainee dairy farm manager once he has finished at Harper this summer. Peter Alvis, RABDF vice-chairman and head judge said the standard of finalists was extremely high this year but Patrick and Aimee both stood out with their innovative ideas and well-rounded arguments. “Patrick had a clear understanding of the challenges and opportunities set to face the industry in the coming years with great ideas of how to exploit these for the benefit of the sector. RABDF vice chairman Peter Alvis, RABDF council member Robert Craig and Chloe Cross from Kite Consulting were this year's competition judges.